Transitional Doctor of Physical Therapy (tDPT) student Mary Saintsing is dedicated to providing excellent care in Winston-Salem, N.C.
Mary Saintsing '18 knew there was a missing piece in her ability to care for patients and contribute to a medical staff. After 43 years of work in physical therapy, you'd think there wouldn't be a whole lot for her to learn. 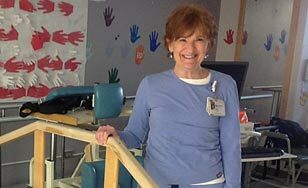 In her time at Forsyth Medical Center (Winston-Salem, N.C.) she's done it all — patients have included those with head or spine injuries, as well as those suffering from neurological damage. She's currently working with patients in the intensive care unit. "I love meeting different people, and I've really enjoyed my work over all these years," Saintsing said. And while it's clear Saintsing had the requisite skills needed to keep her job, she'd determined it was far too easy to get behind on the latest trends in the industry. "With all of the changes in healthcare, I felt like it was necessary [to pursue education] — nurses are going into their doctorates; everyone is heading that way," Saintsing said. "I thought it'd be good to go out with the same passion I had coming in." And that's why she enrolled in the Transitional Doctor of Physical Therapy (tDPT) program at St. Scholastica. Saintsing was looking for a reputable program she could fit into her work schedule, and when she searched around online, she felt the two-year track and 100-percent online program at CSS was the right call. And now that she's begun, Saintsing can confirm the professors and course rigor are excellent. "It's been very interesting and eye-opening to get into the coursework," she said. "Cheryl [Anderson] is excellent as a professor. She's done it all in the PT field, and she just adds so much to the discussion." Saintsing says she has felt fully supported in her online academic journey at St. Scholastica. In fact, after-hours support staff helped save the day when she had an issue with an online module. "A lot of the IT staff are available 24/7 so you don't feel like you're stranded if there's a problem," Saintsing said. "One time I called — it was probably around 10 at night — and they were able to help right away, and I was able to get my work in on time." Saintsing is already reaping rewards from her time in the program. She recalled a recent meeting where exposure to course material allowed her to participate in a conversation that would otherwise have been over her head. "One of the top managers in our department was talking about a new way our hospital gets paid, and we had just studied ‘bundling' in class," Saintsing said. "It's nice to be able to bring more to the table and keep up. Otherwise, I'd have no idea." Saintsing believes the tDPT program at St. Scholastica is an excellent opportunity for those in the industry that desire to stay relevant. "If it's the right time in your life, and you can put the time into it, it's definitely the right thing," Saintsing said. "The support is there and the admissions teams are so responsive. The people are wonderful." Learn more about the Transitional Doctor of Physical Therapy program.